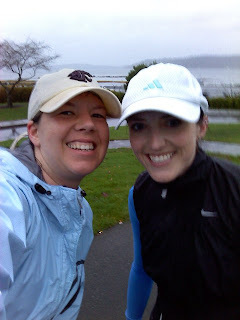 ...I ran in the pouring rain with Kerrie this morning! We met at 7am near the Cedar River Trail and we were the crazy ones going for a long run in the rain. Ah yes, in true Seattle style! 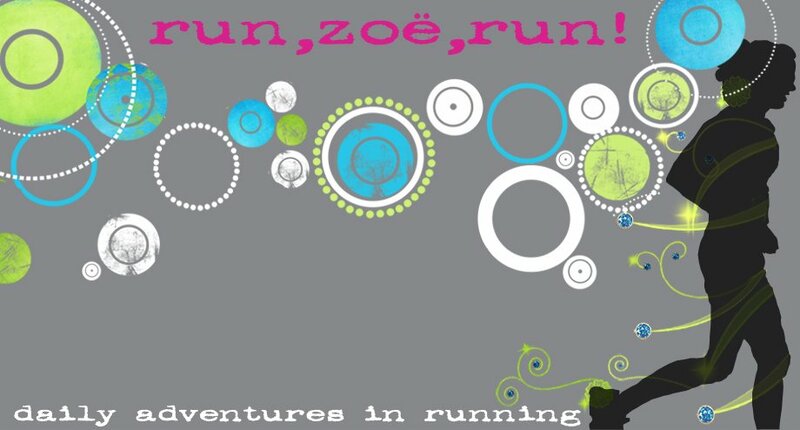 So far, the 11 miler this morning is my longest run to date...and I have Kerrie to thank for keeping me motivated. Afterward, my body was like "um, that was harsh and I'm freezing," BUT the time seriously flew by. Sweetness! We stopped briefly at Lake Washington to take a little breather before turning back, and Kerrie took our picture. Thank goodness for hats! It was seriously freezing outside, and the rain just did not let up once. The trail was nearly washed out when it was right next to the river, and it reminded me a lot of my Rome adventures. We saw some ducks, and one was contemplating running with us, but I think he was too fast, so we gracefully declined. He gave as a knowing "quack" and went for a swim instead. I wouldn't have gone in that water...show off. Towards the end of the run, we ran into another blogger that was in town for the weekend...yes, we're crazy runners that gravitate towards each other! L.B. was a few miles into his 18-miler for the day, and as a native of California, I'm sure this weather was a new experience for him. :) It was fun running into another blogger! Seriously, running with a buddy just makes the time fly. The total time for the run was 1:58:09, 11 miles, 10:44/mile pace. Kerrie ROCKED the end and we were cruising a 9:15 pace for a good 3/4 mile. She's faster than she thinks, folks! I do need to learn how to get mile splits from Gus (Garmin Forerunner 305). Anyone know how? * I need to invest in gloves, I had perma-claw hands after the run and had to start my car with my wrists! I just couldn't get warm! When I was 7 minutes from home, I called Trav and asked him to start a bath for me...perfection. * My blue "superhero" compression shirt is actually for hot weather, and it is designed to keep you cool. Heh. Guess that's why I couldn't get warm? Go figure. * Peanut butter toast is now my favorite pre-run food. * My Nathan water bottle erupts from the straw regardless what liquid I put in it. 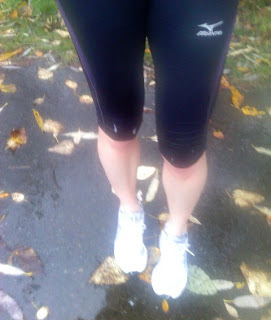 Good thing I was running two hours in the rain, or else it would look like I peed my pants. WIN. It seriously was a lot of fun, and now I'm definitely not as nervous for next week's Half. Bring it! Great job! Congrats on your 11-miler! The conditions were pretty challenging but you two did great. And if it rains next weekend, at least you'll have had this run as training for that part of the race too. Just get the little cheepy knit gloves for $1 at Target. That's what I have and they are perfect. I'm looking forward to a rainy day here - so I can crawl back in under the covers and stay warm! 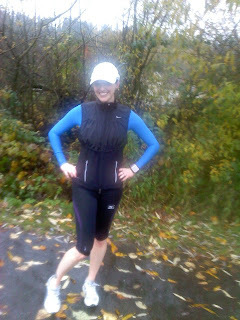 Way to get out and get a nice run in despite the elements. LOL! Your recap made me laugh. I'd forgotten about that duck! And I just remembered how you said you didn't want to go for a swim, yet we LOOKED like we went for a swim by the time we were done! Thanks again for running with me! I had a blast! Awww love it! Sounds like ya'll had fun! Amanda and I beat the rain running on Saturday..When I looked outside Sunday I felt for you ladies. YUCK!! Pretty cool that you ran into LB. this makes me want to run!!! dear work, please go fast so i can go run. love, amy. Whoo hoo to your first 11 miler! If you can do 11, you can ROCK 13.1!!! WTG! I love your list of lessons! And, I think it's hilarious that your pants started to foam! That is totally something that would happen to me...I am way to generous with the laundry detergent!